Here in Australia we have three fast-acting insulins available, although it seems many people are only aware of two. 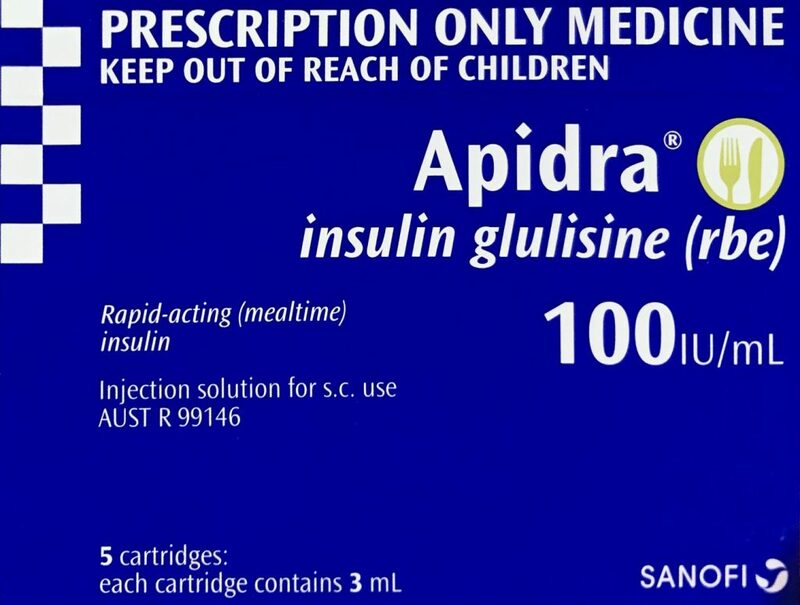 Apidra (insulin glulisine) from Sanofi. These are used for meal-time boluses and corrections by people using injections (MDI), but I’m going to talk here about use in insulin pumps. Many people don’t know about Apidra, for the simple reason that it’s not officially approved in Australia for use in pumps. 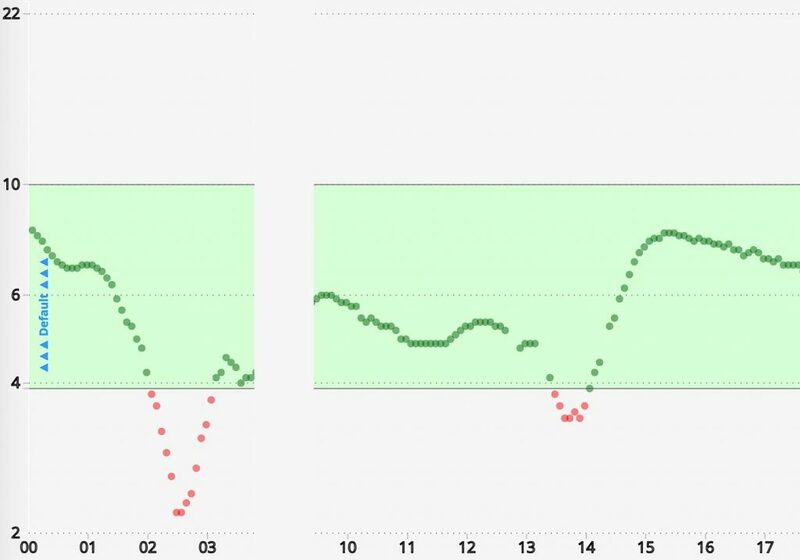 I have used Humalog for about 20 years (almost 9 of those pumping, and 1 looping) but earlier this year I trialled using Apidra in my OpenAPS closed-loop pump system for two months. I went “off-label”! Humalog and NovoRapid are approved in Australia for use in MDI or “CSII” (Continuous Subcutaneous Insulin Infusion, but lets just call it “pump use”). But Apidra is only approved for injections. And yet I know a number of people who have been using Apidra in their pump, and most of them didn’t even know it was “not approved for pumps”. Their doctor set them up with Apidra so that’s what they do. This is OK: it’s just that Apidra was prescribed for them “off-label”. There can be many reasons to use different insulins, with some of the big ones being allergies and reactions to the insulin. Some people find they just don’t get reliable results with particular insulins, but others work great. Why not approved for use in pumps? It seems to come down to occlusions. During the Australian trials leading up to the TGA approval, it seems that users had too many issues with blocked cannulae or tubing. Many people characterise it as Apidra “crystallising” in the tubing after days in our ambient temperatures, although I don’t think it’s quite that simple. As I’ve noted earlier, NovoRapid and Humalog are both listed in Australia as being approved for 2-day use in pumps, but in the US they’re listed at 6 and 7 days respectively. In the US Apidra is listed for use in pumps, but only for 2 days at a time. I wouldn’t be surprised if similar Apidra occlusion problems affected the trials leading up to that FDA approval. So even though Apidra isn’t supported for pump use in Australia, I felt confident in using it as long as I replaced the reservoir every 2-3 days. I know other Apidra users who change their reservoirs much less frequently, but I wanted to play it safe. For Australian Apidra users considering the new Tandem pump, experience in the US seems to indicate that the t:slim’s “bladder” reservoir seems a little more prone to Apidra occlusion problems than the traditional “syringe-style” reservoirs. However, I am told by Tandem staff that if you change your reservoir every 2 days as per the FDA label then you should be fine. If you’re an Apidra user considering the new Tandem pump, even if you’ve been able to get away with 4 or more days in another pump, I would prepare yourself to replace the reservoir every 2 days or so. This was the main reason behind my Apidra trial. Many people report that it acts slightly faster than Humalog or NovoRapid, and with my automated closed-loop system I should be able to take advantage of that: allowing the system to be more responsive to BG changes and hopefully flattening some of my post-prandial spikes automatically. In my loop I find Humalog is modelled very well with exponential curves defined by a peak activity time of 75 minutes, and a total duration (all the way down to zero activity) of 360 minutes (6 hours). This curve is generally used for NovoRapid and Humalog in adults, and it works well for me. Where Fiasp is available people have generally found that the only change is that the peak of activity moves forward to 55 minutes. Note that the apparent onset of activity is well before that time: that is the peak time. But Fiasp isn’t available in Australia (and as I discuss later, I do not want to use it in a pump as I like my liver). Here’s a screenshot from the Loop closed-loop system comparing the insulin-on-board profiles for various models. Although it describes Apidra as using the same model as NovoRapid and Humalog, I found it acted a little quicker. After some experimentation (OpenAPS allows me to select custom activity times on the fly) I found that Apidra worked well with a peak time modelled at 65 minutes. Not as fast as Fiasp, but definitely faster than Humalog or NovoRapid for me. Incidentally that matches Loop’s “Rapid-Acting – Children” setting. For the last 35 years I think I’ve had reasonable awareness of hypos. As my BG drops below 4 mmol/l I usually feel it, before my CGM alerts me. If I’m asleep I won’t notice it as quickly, but I will wake up if I go low. Several days after starting on Apidra I noticed a change. My levels were bouncing around a bit as I continued to tweak the loop settings, and my CGM would sometimes be alerting me that my levels were in the low 2s! And a finger-prick would confirm it. But I wouldn’t have felt anything unusual! Sometimes when I then got up and moved to get some food (or a BG meter) I would start to feel some of the usual “wobbly” feeling. But I was very glad I was using CGM, as effectively with Apidra I lost my hypo awareness. My loop is designed to keep me out of hypo territory, so I pressed on with tuning the loop and it wasn’t a show-stopper issue. But when I eventually moved back to Humalog, within 2 days I felt my classic hypo symptoms at 3.8 mmol/l. I’m glad the effect wasn’t a permanent change in my hypo awareness! Once I got the loop tuned, Apidra worked fairly well for me. On the whole my levels were fairly well controlled, but with occasional weird things (which I’ll describe below). 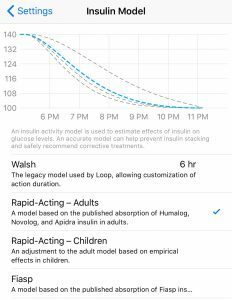 As well as tuning the loop’s model of the insulin’s activity profile, I had to tweak my basal rates and sensitivity factors. Although Sanofi advises that the dosing of Apidra should be the same as for Humalog, I found I had to increase my doses across the board by about 4%. If I was using injections it would have probably been hard to notice a change that small, but the repetitive calculations of the loop made it easy to settle on the change within days. When I switched back to Humalog undoing this change was simple again. At first I changed both pump reservoir and cannula every 2 days as per the FDA label, but gradually tweaked that. I changed cannula every 3 days as per normal, but kept replacing the reservoir every 2 days (only filling it with less than 100U). This meant that every 6 days I would be replacing them both at once. Once that routine was in place I never noticed any change in insulin sensitivity that could be tied to a cannula or reservoir change. After more than a month using Apidra I was confident enough with the system to keep using it while I spent 3 weeks travelling in Africa. Although Apidra is rated as safe for 4 weeks at only up to 25˚C (compared to 30˚C for Humalog and NovoRapid) my Frio cool packs kept the temperature within range throughout the trip. My backup supply of insulin in another bag (we take backups for everything) was Humalog just in case I needed to switch back. Incidentally, for years I travelled with Humalog and Lantus with no problems including to equatorial regions. Lantus was also only rated as safe up to 25˚C (although in late 2016 its Australian rating was upgraded to 30˚C) and I was confident in my insulin storage. Although I got the onset of Apidra action modelled fairly well, I did often have problems several hours after a meal. The system would have dealt with the meal and kept my BG levels from rising too high, and sometimes everything just continued to work smoothly. But sometimes my levels would start dropping. My loop would immediately suspend the basal insulin flow, but my levels would just continue to trend down. And if I didn’t have a snack at some point, eventually my CGM would be alarming me. After getting used to flat levels all night with the closed-loop, it’s very frustrating being woken up by low alarms from your CGM again! After lots of experiments I never got to the bottom of this phenomenon, but the best theory I have comes out of discussions I’ve had with athletic friends with T1D. The essence is that deposits of Apidra may have become held in my tissues, and later released at unpredictable times due to exercise (in this case even just mild exercise such as walking around before going to bed). It’s the best explanation we managed to come up with, as there was definitely insulin suddenly active in my system at those times. Will I go back to Apidra? Probably not. If I was stuck without Humalog I would be OK to survive on Apidra, but the major things that count against it for me are the hypo unawareness and the unpredictable “tail” of activity. Once I moved back to Humalog my levels flattened out again, and I’m happy to put up with the slightly-slower response in favour of that. It’s not a significant-enough change in speed that I can avoid manual bolusing for meals entirely (although even with Humalog the system can handle that, just with spikes sometimes going above 10 where I prefer to keep things lower). I’ll stick to Humalog while I wait for the next revolution in insulin technology. Fiasp is an accelerated form of NovoRapid which is touted by some as a magical step forward. It’s not available through PBS in Australia yet, but even if it did become available I would not use Fiasp in a pump. It seems to work well as a bolus insulin, but I do not want to use it as a basal insulin in a pump. It accelerates the absorption by mixing in nicotinamide, but we have not seen any testing of the long-term effects of infusing nicotinamide (a substance which is implicated in liver problems, and the liver is very significant in our processing of insulin). Enough problems have been reported with Fiasp by users (see some of Diabettech’s articles for pointers) that I do not intend to go down that path (although I did experiment with it for several weeks earlier this year). We’ll see what the next revolution in insulin brings! Awesome article! I have been looking for a faster acting insulin and have some important things to think about.